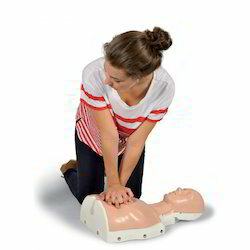 Simulators and trainers allow students to learn about different techniques in nursing, medicine and hospitals without having to work on live patients. We offer the full range of Simulators and Trainers from 3B Scientific, Germany and several other companies all over the world. 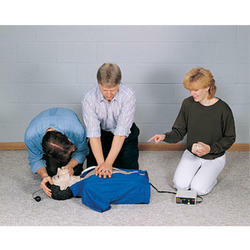 These include products like Childbirth Simulators, I.V. Trainers, Nursing Baby etc. This gynecological simulator ZOE represents a female adult lower body with relevant internal anatomical landmarks and anatomically accurate female genital organs, fimbriae and ovaries. Various pelvic examinations can be trained with this gynecological simulator including laparoscopy, mini-laparotomy as well as recognition of pathologies and placing of contraceptive devices. 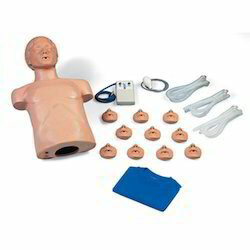 Rubin The 3B Scientific® Birthing Simulator P90 BASIC is made of soft vinyl (hard for inner structures) and silicone. It is easy to clean and all parts can quickly be changed without tools (pin connections). View the internal abnormalities using any conventional hysteroscope. This high-quality, strap-on intramuscular simulator is a lifelike model of a right buttock with all important anatomical landmarks for intramuscular (I.M.) injections: iliac crest, anterior superior iliac spine and greater trochanter. The integrated fine electronics provide extremely graphic feedback when training the intramuscular injection technique, correctly administered injections will produce audiovisual feedback. Additional training and control modes are available for checking results either immediately or upon completion of a training session. 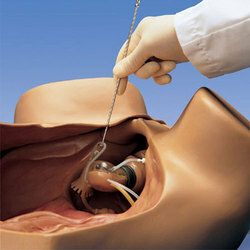 This anatomically realistic injection simulator is supplied with a 21G/0.8 injection needle and a 5 ml syringe. 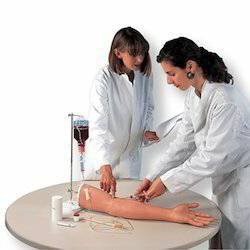 This injection arm, made of 3B SKINlike™ silicone, is unique in quality and design and allows realistic training to teach competence to medical staff. It is also very suitable for group instruction because of its high quality, stain resistance and easy-to-clean soft material. Delivered with stand, artificial blood, 2 replacement tubing systems, plastic bottle, syringe and deluxe storage carton.